We’ve never hid the fact that we like what CFMOTO has been doing lately. We have been a media partner with them for a while now and enjoy working closely with the company. We want you to know, however, that when it comes to reviewing the ZFORCE 1000 EPS LX, we are being completely objectionable. You may ask why we would start out a review like this. Well, we want you to know that we are being completely honest and serious when we talk about liking the machine. This is the most fun CFMOTO unit we’ve driven. 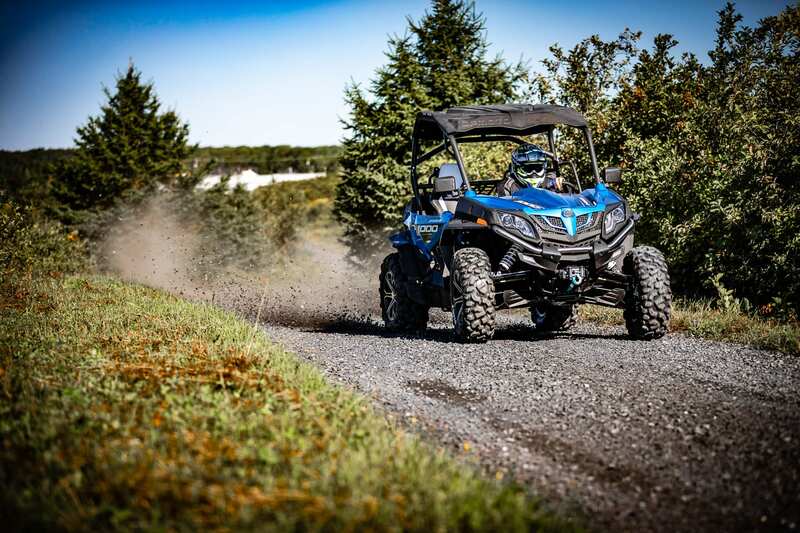 One of our favorite classes for UTVs is the 60-inch class. That width works very well for trail riding on a broad range of terrain types with the agility for tighter trails and the stability for faster driving and more open areas. Most of the players in the category offer a 1000-class engine size, too. Of course, the horsepower amounts vary and that’s fine. There is really a fine line between the right amount of power and too much power. We’re not sure where that line is yet, but we’ve heard it’s there somewhere. The ZFORCE 1000 has plenty of horsepower and is the most powerful CFMOTO machine going. The CFMOTO VForce 1000 EPS LX is powered by an all-new 962.6cc V-twin, eight-valve, liquid-cooled, four-stroke motor with a 91x74mm bore and stroke and a 10.6:1 compression ratio. For 2018, they also added a Bosch electronic fuel injection system and ignition. This helps create a stable and powerful motor combination that has really strong reliability and performance. The CFMOTO motor is very torquey and fun to drive, producing 60.5 ft/lbs of torque at 6,200rpm. It’s especially noticeable when you’re in some tighter terrain and you chop on the throttle. 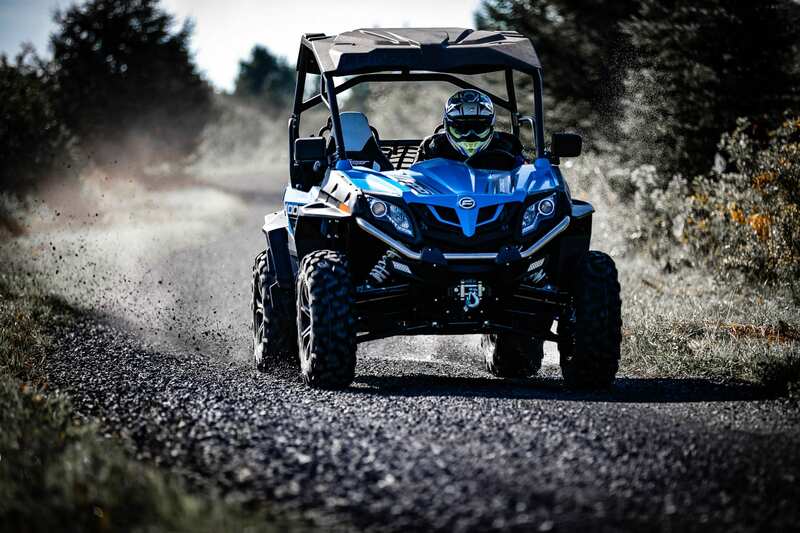 The ZFORCE will pop loose in the rear and let you hammer your way around. Horsepower is right in the hunt with the class, at 80hp. It’s not tops in the 60-inch class, but close enough, and when you combine it with the torquey motor, it’s in the hunt as a fun machine. The transmission is a CV-TECH IBC belt-type transmission with primary and secondary variable dry clutching. It’s a new transmission for CFMOTO for 2018 and it is designed for durability and reliable performance. That’s something you’ll see us mention several times as you read this. CFMOTO has been hard at work to add in more reliability to their machines, that were already reliable to begin with. The sport is growing, but there are certain brands that have been having issues with reliability and recalls. 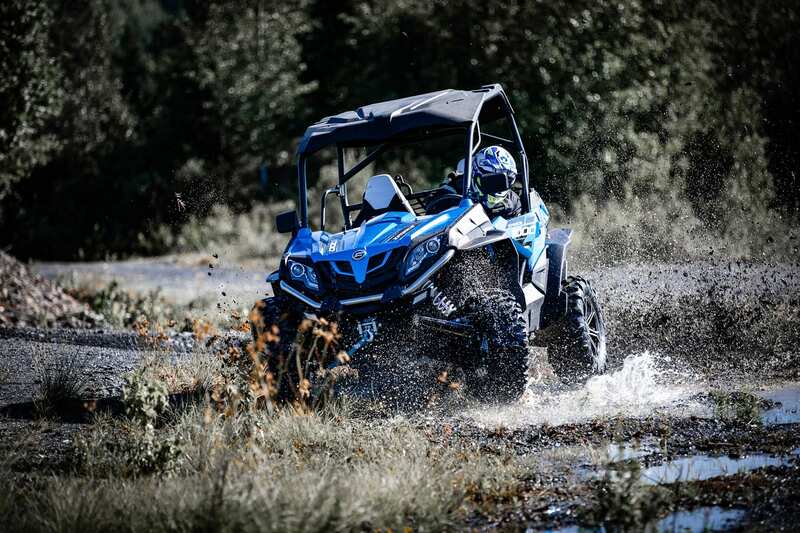 A new UTV is a significant investment, and CFMOTO wants to be a brand associated with value. To be a valuable machine, it has to run when you want it to. 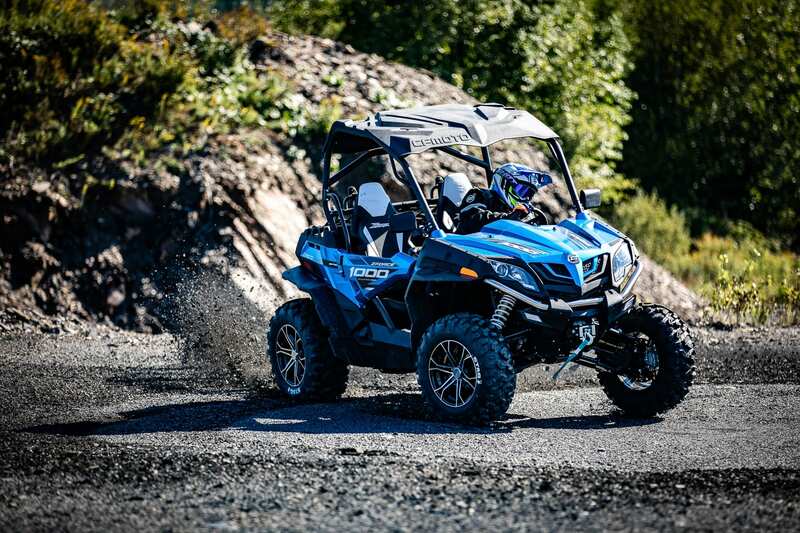 The VForce 1000 EPS LE has two- and four-wheel drive with an electronic locking differential. Again, new for 2018 is an all-new heavy-duty rear differential that adds to the overall reliability of the machine. As we said earlier, the CFMOTO has a very torquey motor. Having a weak rear dif can lead to a trailside mechanical failure when you have a torquey motor that makes you want to drive aggressively. Plus, if you want to modify the machine down the road, or add bigger tires, etc., it is nice to know the rear differential can handle the extra load. As we have said, the ZFORCE 1000 is a 60-inch class machine. It actually comes in a little less, at 59.4 inches, or 1,510mm. It is 113 inches, or 2,870mm long and has an 80.3-inch (2,040mm) wheelbase. 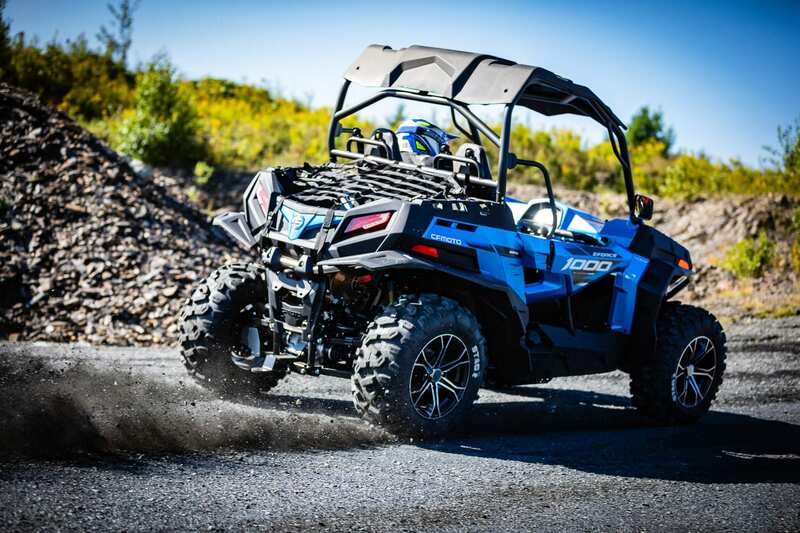 That wheelbase puts it slightly longer than the competition from Polaris in the RZR S line and under the new Can-Am Maverick Sport. Steering is light and predictable with the proper amount of power steering assist. Some might find it a little light, but it works very well. We found the overall stability to be very good at speed when you’re flat out on open terrain, and very good at slower speeds in tighter conditions. There is 310mm of ground clearance to clear most obstacles along the way. CFMOTO adds steel skid plates to the machine in case you run out of room while driving over rocks, trees and other fun stuff. It rolls on 27-inch Bighorn tires that have a 6-ply rating, good enough for most conditions. The tires are wrapped around 14-inch aluminum alloy rims that look sharp, save weight and are strong and durable. The ZFORCE 1000 EPS LX has a curb weight of 610kg, making it right in the ballpark for the class when compared to the competition. The fuel tank holds 27 liters, and that will get you on the trail for a long time, although honestly, we wouldn’t mind seeing the size of the tank go up some. When you’re out in the remote areas, fuel isn’t something you can find easily and we do like to explore. There is a 2-inch receiver hitch for towing and the ZFORCE will tow 250kg without much effort. Let’s be honest here. This is more of a sport machine, and towing isn’t usually tops on the list for requirements. You can haul 100kg in the cargo bed, too, and there are side rails which work great for tying down the load. CFMOTO added extended fender flares to the rear of the ZFORCE to provide added protection to the rear cargo area from mud and dirt coming up off the rear tires. It is an appreciated feature that not ever manufacturer adds. With only one, possibly two exceptions, there is no stock suspension system that can’t be improved upon. After wheels and tires, it is usually the next area that gets modified by owners. What you want is a stock system that works well, and the ZFORCE 1000 does indeed work very well. The CFMOTO has dual wishbone setups front and back with gas-charged shocks that have independent rebound and compression adjustments. The front has 283mm of travel and the rear has 280mm. The ride is smooth and quite predictable, letting you set the system up to meet your riding style and conditions. We hammered the machine through a wide range of conditions including rocks and rutted woods riding and the ride quality was very good. CFMOTO also added a new braking system for 2018 that has a strong feel and doesn’t overpower the suspension. That is a key thing, as when you get hard on the brakes, if the suspension isn’t dialed in, it can make things sketchy. The seating in the CFMOTO is comfortable and has support where you need it. The seating position is good and lets you drive all day without extra fatigue. The steering wheel is adjustable to fit a broad range of drivers, an important part of a sport machine. There is a full digital information center in the dash to feed you speed, RPMs, temperature, fuel level, time and more. It is well position so you can see this information without having to go searching for it. CFMOTO designed their ROPS cage to keep you safely in the machine. This includes some additional bolstering built into the steel ROPS to keep your shoulders planted inside the machine in case of an accident. Some people love the additional security, while some with really wide shoulders find it restrictive. We had no problems with our test drivers, but it is something to be aware of, especially if you’re other job is as a defensive lineman for a football team. As you may have noticed from other CFMOTO machines, they have a few things they do as standard features that other companies do not. Stainless steel bumpers and exhaust are nice touches that add a touch of class and style, along with durability to the machine. We like these features, too. One feature that we really wish more companies would follow on is adding rearview mirrors. CFMOTO adds mirrors and it is such a welcome addition. Along with the mirrors, they add turn signals and a horn. 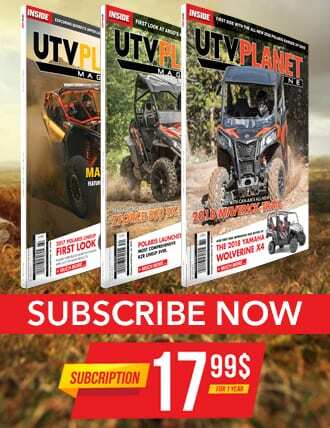 In some parts of the world, UTVs can be registered to drive down the road the same as a car. Even if you don’t live in one of those areas, these are also welcome additions, as it can make the trail ride that much safer. Imagine being on a trail ride with your buddy behind you and being able to signal him that you’re planning a turn. CFMOTO adds a 3,000-pound rated winch to the front of the ZFORCE too. It’s nice to not have to buy one extra when you pick up the machine and we are happy it’s there. A winch is a smart tool to have along the trail and pretty handy. 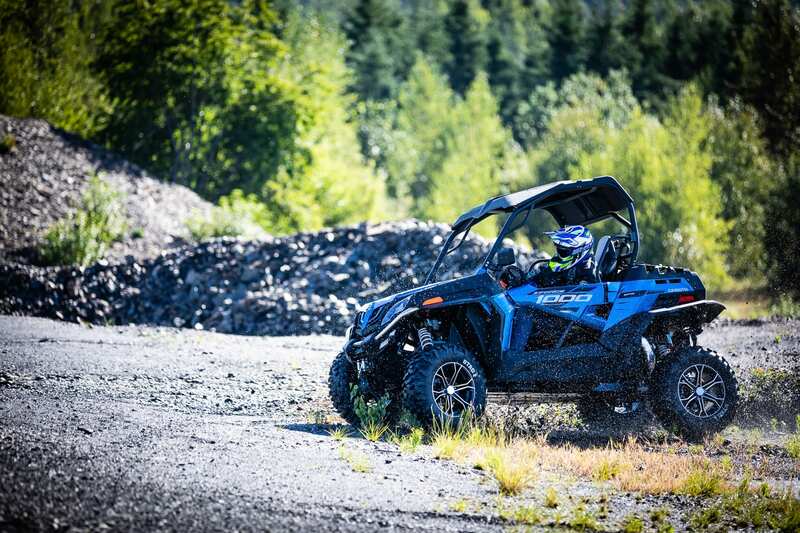 Overall, we are very impressed with the CFMOTO ZFORCE 1000 EPS LX. It is a great machine and a great value, with a starting price of $16,995 in Canada. 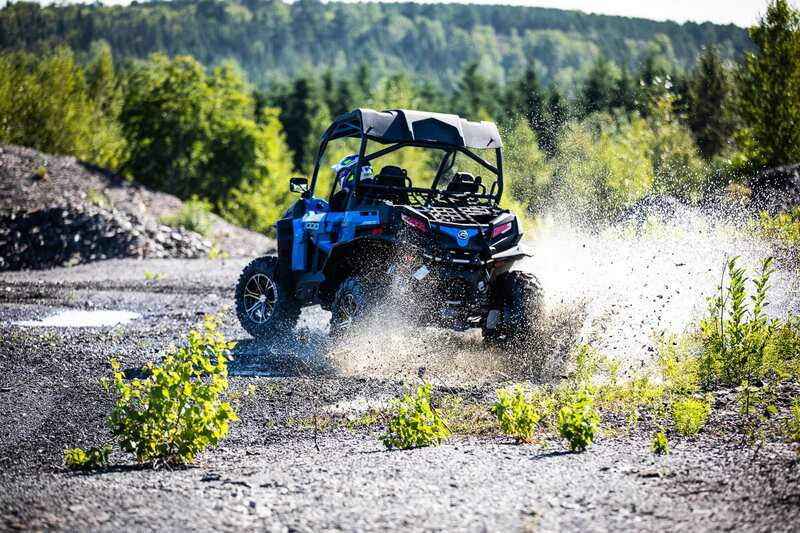 Add on the five-year limited warranty and you have a solid, dependable machine that is a lot of fun to drive across a wide range of terrain types. 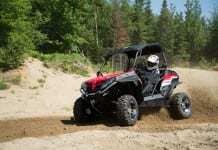 If you’re in the market for a sport UTV, give this unit a look. You’ll be happy that you did.